Hope you guys are having a good month so far. I know Christmas is coming but it hasn't quite hit me yet! I'm heading to the Munich Christmas markets soon, so I'm sure I'll have all the festive feels then :) Let me know what festive plans you got coming up or if you're not really a Christmassy person (don't worry I won't tell!) 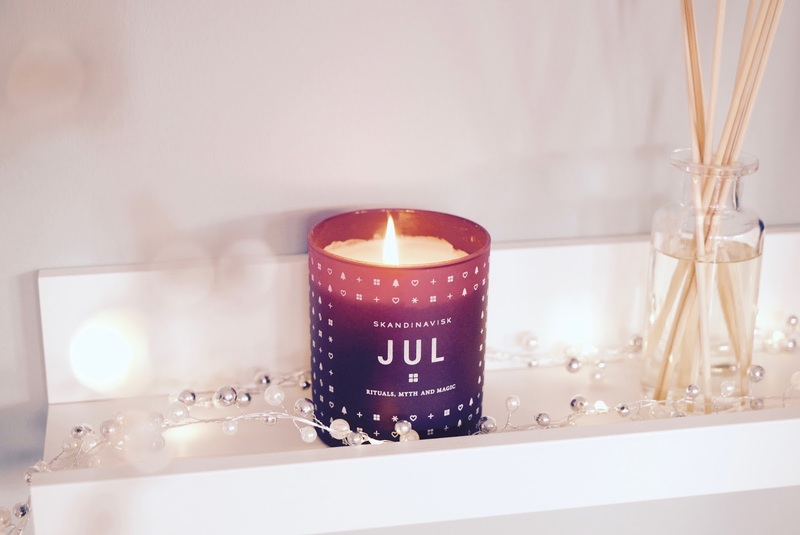 Anyway Winter feels like it well and truly here, so lets embrace the season, here are some ways to make our homes extra cosy for those nights in. 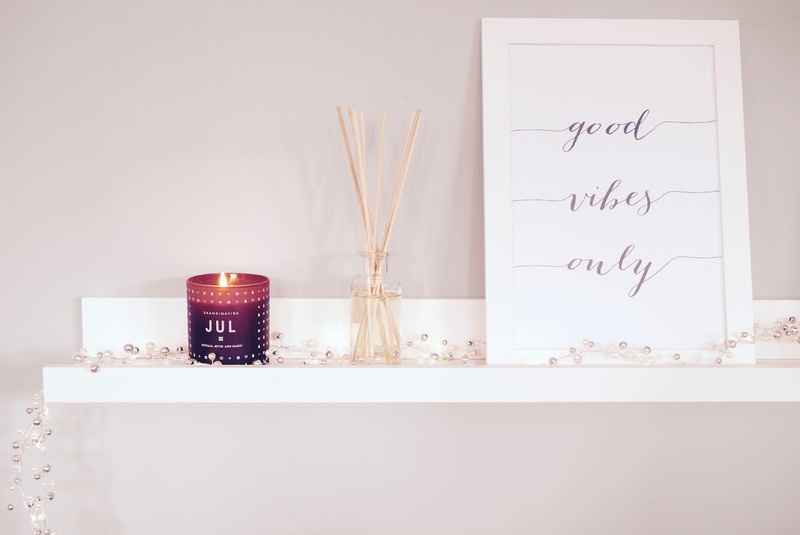 Us bloggers love candles don't we :) The right scent and candles totally sets the mood in our home, it's relaxing and creates a warm and inviting feel. This Winter I'll be lighting the Skandinavisk Jul Christmas candle* from Amara, I could smell the scent even in the box and plastic wrapping! It's a lovely warm spiced scent with cinnamon, cloves, gingerbread and glogg. It's made from vegetable wax and the scent is really comforting on a cold day. The candle has little simple Christmas designs on the red glass, perfect to place on your mantle piece or shelf. I also like to have diffusers for a sutble aroma around the home. I was reading about Skandinavisk and they're all about creating cosy feels. 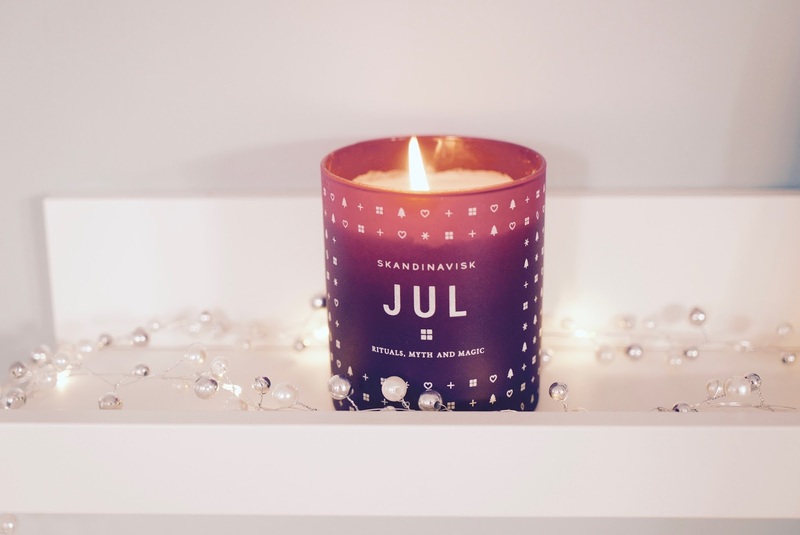 They believe in the magic and essence of Scandinavian living, the warmth, scent and light of a flickering candle and turning any moment into something cosy. This season seems to be all be about Danish Hygge, Swedes 'mys' or the Norwegians 'kose'. Either way I'm on board to embracing the simple things to find happiness and joy and creating that snuggly Scandinavian feeling! 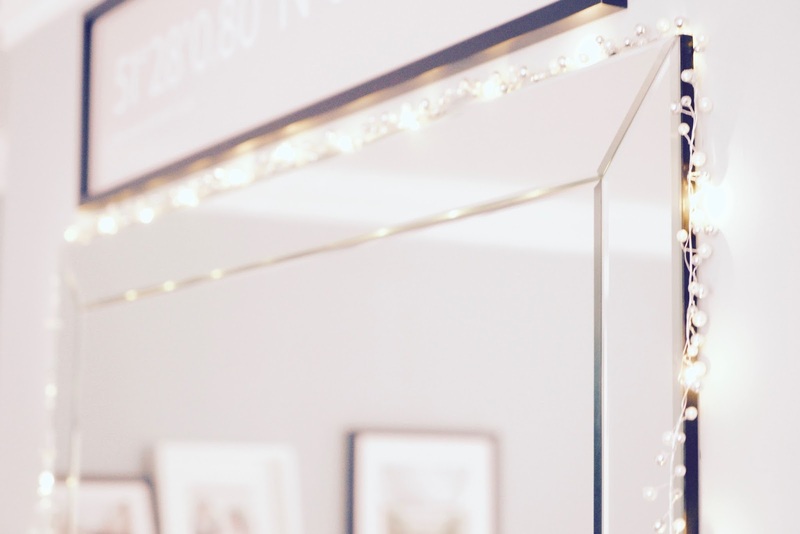 Twinkling fairy lights are not just for Christmas trees but a lovely way to create a Santa grotto feel in your home. I really like these Juliet Light Decorations* they're small LED lights, with grey and white pearls in between. It's really handy as it's battery powered, so you don't have to worry about plugging them in and it has a self timer to switch off automatically after 6 hours. I like how they're decorative and subtle and create a nice warm mood in your home. I've decorated some around our mirror and shelf, you can also use them around your mantle piece, bed frame, anywhere to add a bit of twinkle! Time to crack out the Christmas DVDs or Netflix because nothing says a cosy Christmas home than watching movies! 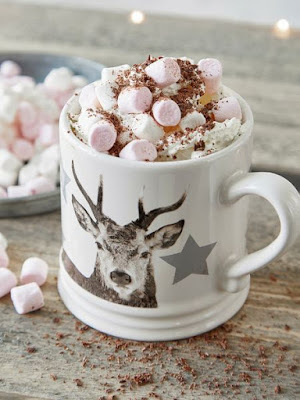 Create your own movie night with twinkly lights, a big mug of hot chocolate, sweet treats and snuggle up on the sofa, whilst watching all your favourite films. I know I'll be watching the classics Home Alone, The Holiday and Elf :) What are your favourite Christmas films? 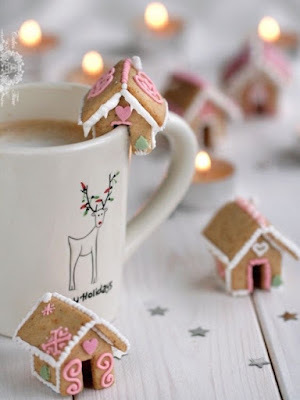 I was looking on Pinterest and they have so many cute festive drink recipes, from spiced orange hot chocolate to cookie recipe, how cute are these ginger bread cookies. This is the season for copious amounts of sugar! Being comfortable is key to a cosy home so adding soft furnishings is a simple way to add comfort and festive touches. You can add cushions on your sofa and bed for a more homely feel. Add some throws to cosy up on the sofa with or around the fire, if you're lucky to have a fireplace! I want to get some fluffy pillows and a plush rug to soften our front room. Don't forget yourself too, don your favourite pyjamas, fluffy socks or slippers and embrace the cold season. I hope you enjoy this homely post, I love being snuggly at home when it's cold and rainy outside! It's crazy how fast November is flying by! What are you up to this week? Have you got your eye on anything for Black Friday? How do you make your home cosy for Christmas?